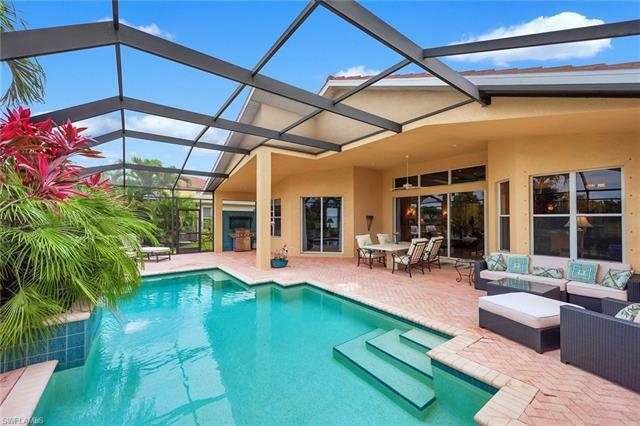 28850 Kiranicola Ct, Bonita Springs, FL.| MLS# 218039940 | Southwest Florida Residential Real Estate for Sale. SKIP THE GOLF WAITLIST! IMMEDIATE GOLF MEMBERSHIP ATTACHED to this exquisite slice of paradise. Seller says BRING OFFERS! This home is truly one of a kind, combining elegance with meticulous care and an unmatched pride of ownership. Upon entering the foyer via the double glass doors you are immediately greeted by soaring double tray ceilings and breathtaking views overlooking the custom pool and out onto the golf course. LOADED with upgrades, this home is completely move-in-ready with furnishings being offered as negotiable. Features include a custom geometric pool, an extended lanai with privacy walls, enhanced lightning throughout, GE Profile series cook-top, beautiful lush landscaping, marbleized columns and custom interior paint, and incredible Western sunsets from your private lanai. Residents of Palmira have private access to the lovely Renaissance Center complete with a lagoon-style pool, olympic sized lap pool, spa, restaurant, and well equipped fitness center. Palmira Country Club also offers a 41, 000-square-foot clubhouse, dining room, grill, pro shop, billiards, an active social and tennis/pickleball program and a Gordon Lewis designed 27-hole championship golf course.